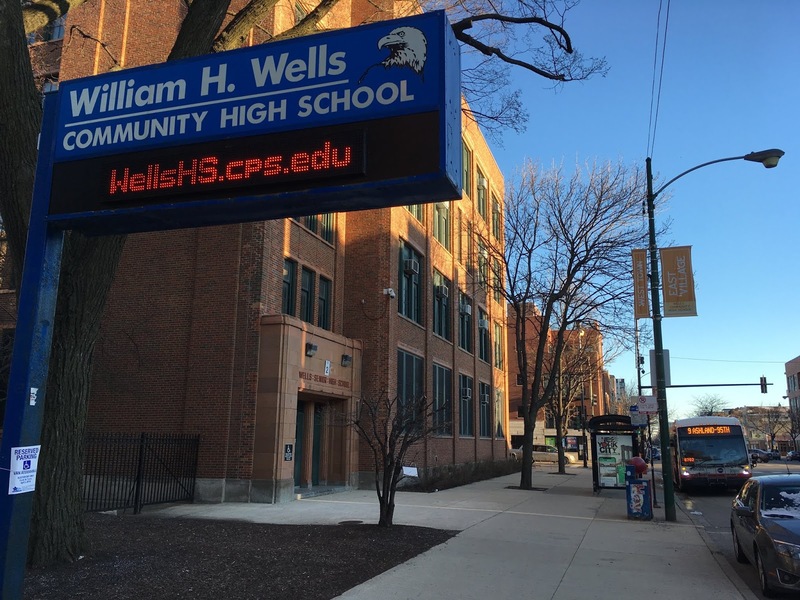 Wells Community Academy High School, 936 N. Ashland Ave.
Wells Community Academy High School has been allocated $120,000 as a "magnet cluster" in fine and performing arts. This program adds art, music, dance and drama to Wells' specialties in JROTC, law and computers, and allows the neighborhood school at 936 N. Ashland Ave. to attract more students from outside its boundaries. Wells Principal Michael Stosek will address East Village Association members June 3. While Wells won the fine arts designation, Ogden International School at 1250 W. Erie St. bid unsuccessfully for a bilingual program to complement its international baccalaureate designation. Michele Dreczynski and Grand Drutchas told members they've been working to establish a local language academy high school, devoted to bilingual proficiency, which benefits pupils across discipline. The region has potential as a bilingual anchor: a Chicago Public Schools study indicates a high concentration of elementary language programs and an above-average number of parents opting out of neighborhood high schools. More options would encourage parents not to seek alternatives in the suburbs. 1st Ward alderman-elect Daniel La Spata accepts congratulations from 2nd Ward chief of staff Jose Rivera. Ward chief of staff Jose Rivera says police Cmdr. Stephen Chung has responded creatively to crime patterns in the north edge of the 12th District. Community policing will change under a court-supervised consent decree now in effect. Officers will receive additional training in impartial policing and crisis intervention under a federal monitor. Detectives will have more time to clear cases. Volunteers on April 27 will clean Eckhart Park, 1330 W. Chicago Ave., to mark Earth Day, said Ben Beadles of Friends of Eckhart Park. Garden plots are tended the first Tuesday of the month from May till September. Fundraising will support youth sports and purchase park benches, said Claudia Sainsot. More information is available on Facebook. 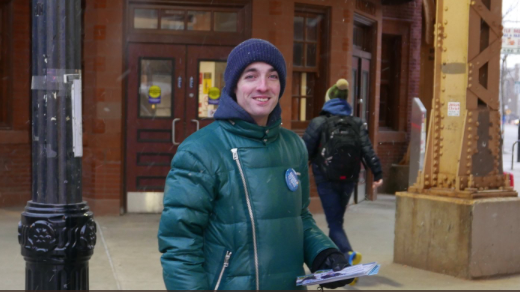 1st Ward alderman-elect Daniel La Spata will join us Monday and likely field a few questions. Jose Rivera, chief of staff to 2nd Ward Ald. Brian Hopkins, will give an update on safety and security, and we'll talk about next steps for the Shake-It bar-restaurant at 820 N. Damen. Join us at 7pm Monday at Happy Village, 1059 N. Wolcott. Loop Tavern, 1610 W. Chicago Ave.
Loop Tavern will add lights and cameras in a planned facelift. Manager Steve Kontos says at first there was interest in exposing the original facade. But even with the arrival of upscale neighbor Beatnik restaurant and Hoosier Mama Pie Co., customers argued for keeping the retro exterior cladding. Kontos pledged not to serve single beers, malt liquor or fortified wines in a plan of operation the EVA board reviewed Jan. 14. 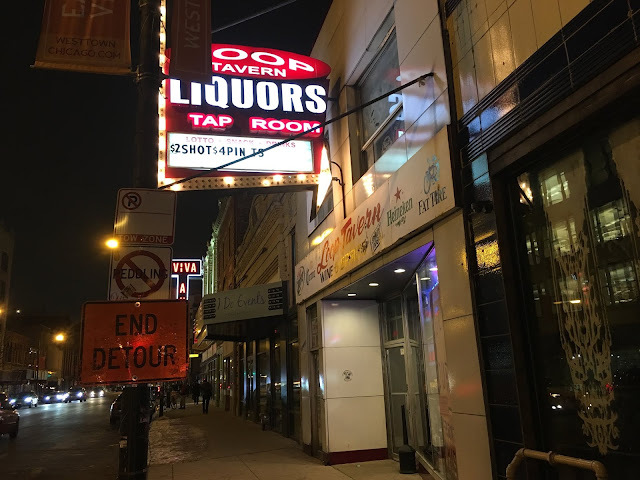 The liquor store and bar at 1610 W. Chicago Ave. plans to transfer ownership and management to the current owner's son. The board had no objection. Chicago's election for mayor, alderman and other city offices is Feb. 26. Instead of the monthly East Village Association meeting, the first Monday in February will be a Candidates Forum upstairs at Roots Pizza, 1924 W. Chicago Ave. Candidates in ward and citywide races will give short statements, mingle and answer voter questions. The Feb. 4 event starts at 6:30pm. EVA is co-sponsoring with Chicago Grand Neighbors Association, Smith Park Neighborhood Alliance, Ukrainian Village Neighborhood Association and West Town Neighbors Association. 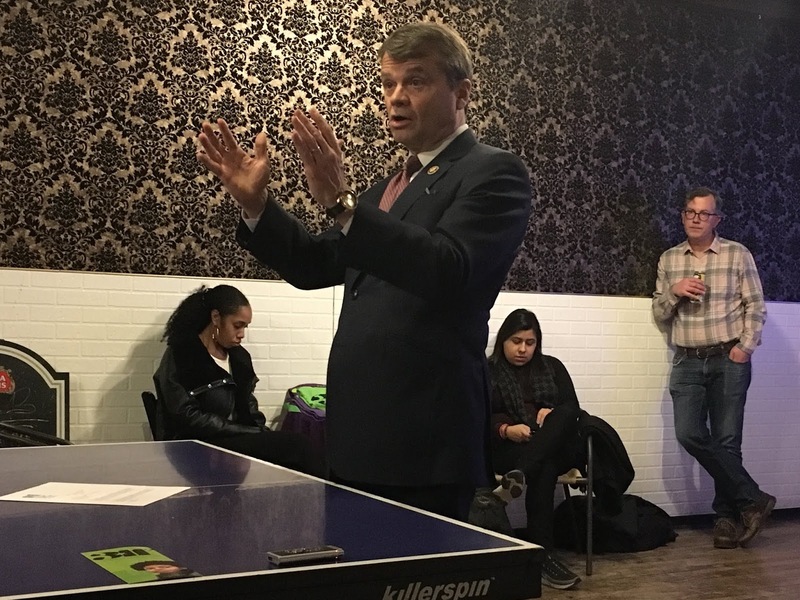 Rep. Mike Quigley speaks Jan. 7 in the monthly EVA membership meeting at the Happy Village. Soliman Khudeira of the Chicago Department of Transportation presented tentative plans for bridge construction at the Chicago River. A wider Division Street bridge at the North Branch accommodate two lanes of traffic each way, plus a left turn lane and riverwalk. Work should start in the third quarter of 2020 and finish at the end of 2021. On Chicago Avenue, a temporary bridge will be in place next month to replace the Halsted Street viaduct now being removed. The permanent bridge will be similar to the Division Street project. Expect construction to extend from the start of 2021 till mid-2022. Nelly Benitez of The William Everett Group demonstrated the new 311 Chi mobile app, part of city call center improvements rolled out in December. The app will take service requests, send alerts when work is being done and take feedback. All service calls in a neighborhood can be shown on a map. U.S. Rep. Mike Quigley has a track record of showing up at EVA meetings since his days on the county board. He says he'd rather go back to talking about constituent services, but as a member of the House Intelligence Committee he has work still to do in investigating foreign influence in the 2016 election. An open question: Was the president compromised?